Compose, transcribe and edit music the way you want it! MagicScore Maestro offers everything a musician could ever dream about. Whether you are a proffesional or amateur, the software will provide you with powerful features for typing or editing scores. Being used by musicians all over the world, MagicScore Maestro allows you to quickly and easily lay out and typeset music, and produce high-quality scores that can be easily played back and printed out. A range of user-friendly features makes this program the fastest way to create music and arrangements. MagicScore Maestro is a perfect companion for composing and arranging scores. Now composing is much easier! You can write and listen your music and also can edit the sound of the scores as you like. We added more than 10 sound effects corresponding to different methods of playing. Glissando, Bends, Hammer On / Pull Off, Vibrato, Stopped Note etc. The active focus has been added. A New Brief Quick Start Guide is created. Publishing music on the Web, via your webpage or our music portal. 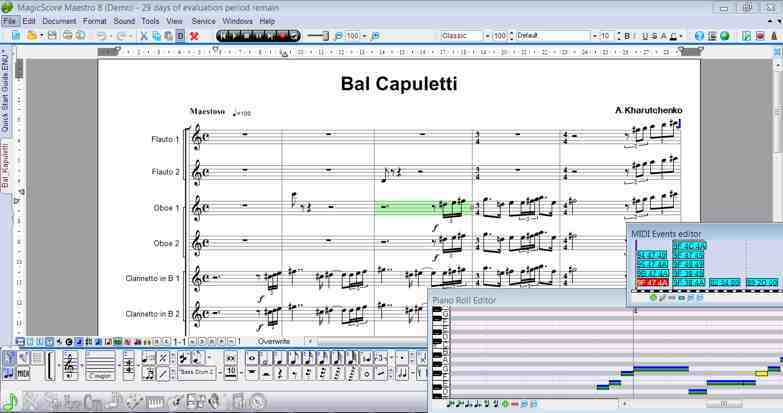 music, notation, software, scoring, composing, score, sheet music, make music, program, editor MagicScore Maestro is a perfect tool for any musician. Offering features for easy composing, aranging and notation, this software is developed for both professional musicians and amateurs.